“We are absolutely delighted to announce that NICE has given the green light to Abraxane®, a drug that can extend the lives of pancreatic cancer patients. This means that patients in England, who represent 83% of pancreatic cancer patients in the UK, will now be able to have access to the drug. Trials have shown that Abraxane®, in combination with gemcitabine, can extend a patient’s life by an average of 2.1 months, although in some patients it was shown to be significantly longer – up to 2-3 years. The drug was has previously been rejected by the NHS’ health drugs rationing body. “It is wonderful to learn that Abraxane®, a drug that can give so many patients and families extra time, has finally been made available to pancreatic cancer patients via NHS,” says Ali Stunt, founder and chief executive at Pancreatic Cancer Action. Pancreatic Cancer Action took a leading role in campaigning for the drug to be approved, including a demonstration outside Public Health England in 2015, and highlighting the issues in the media. The treatment of pancreatic cancer remains an area of unmet need, with around 8 in 10 cases diagnosed at a late stage in England and Scotland. Survival rates have shown minimal improvement over the past 40 years and the disease has one of the worst five-year survival rates of common cancers in England and Wales. In the 1970s, 1% of people diagnosed with pancreatic cancer survived their disease beyond ten years, today it is still approximately 1%. Every day in the UK there are approximately 26 new diagnoses of pancreatic cancer, as well as an estimated 24 deaths due to this disease. mPDAC [median overall survival (8.5 months vs. 6.7 months, respectively) (Hazard Ratio for death 0.72; 95% Confidence Interval 0.62 to 0.83; P<0.001)].6 A post-hoc updated overall survival analysis with an additional eight-month data cut-off confirms the results seen in the Phase III MPACT trial. we will continue our research in this area of considerable unmet need”. WHO advises less than 25 grams a day? 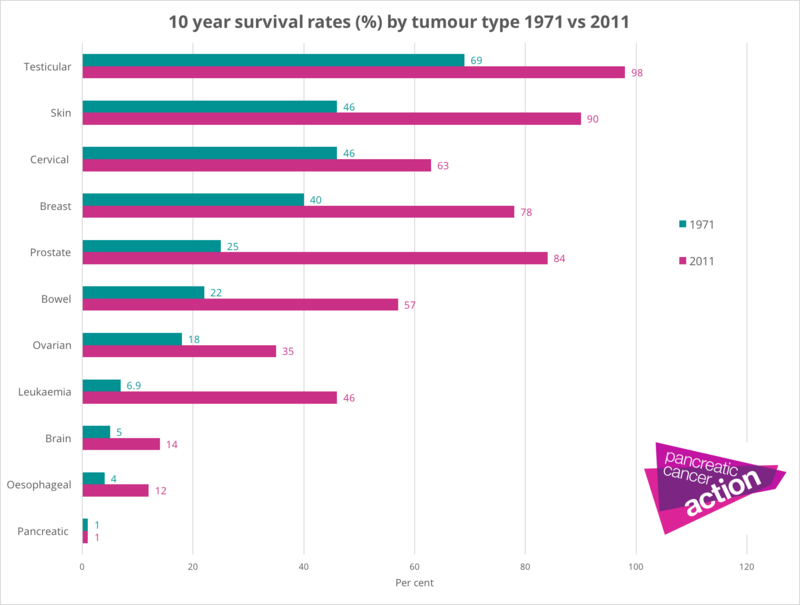 Pancreatic cancer – survival rate unchanged in 40 years! Last week on World Cancer Day, Cancer Research UK released the latest statistics showing that cancer deaths in the UK have fallen by almost 10% over the last 10 years. 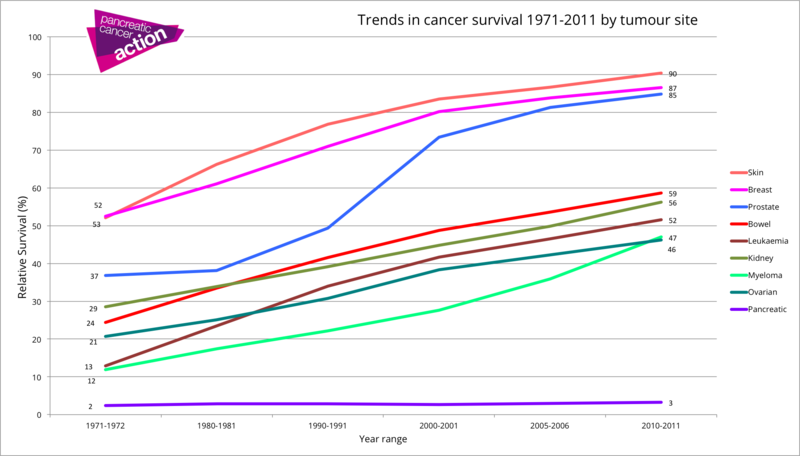 In addition, the 10 year survival rates from some cancers have significantly improved since 1971, all of which is positive news. However this is not the case for pancreatic cancer where the rate of people dying from pancreatic cancer has not only increased by 8% but the 10 year survival rate still remains BELOW 1%, the same as 40 years ago, which quite frankly is appalling. The general consensus for the poor survival rate is that it is often diagnosed too late, as there are few symptoms. However there is also another factor which is the lack of funding for research into pancreatic cancer which lags well behind that of other cancers. I know that this will change, it has to, because as research into others cancers results in earlier diagnosis, treatment and longer life expectancy then at some point in time the spotlight will eventually be on the incredible low survival rate of those with pancreatic cancer. Also I believe that the incidence of pancreatic related illness, like Acute and Chronic Pancreatitis, Cancer and Diabetes will continue to increase. Why? Because the pancreas is the one organ that regulates sugar levels in the blood and also the only organ that digests fats. So as our diets continue to increase in fat and sugar, namely in processed foods, so to will the stress on the pancreas. If you want to show your pancreas some love try to moderate your consumption of sugar, fat and alcohol or at least take the time to read the label on 1 or 2 ready meals in your trolley, whilst waiting at the checkout, starting with what you buy the most. You may be surprised by their contents, I was and I had thought that I was a healthy eater.